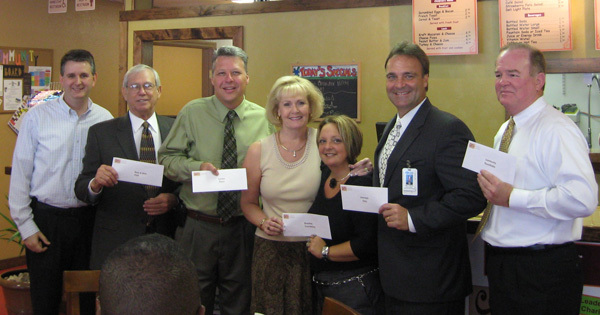 At the 2010 check presentation lunch, over $10,400 was given to the celebrity chefs for their location charities. From left to right: Darren Denington, Dr. Earl Lennard, Tony Del Castillo, Anne Nymark, Tammy Bracewell, Mike Fencel and George May. For the second year in a row, Copper Bell Café owner Darren Denington will host local celebrity chefs who will cook up some of their favorites to share in the name of charity. Cooking for a Cause II will take place at the Copper Bell Café every Monday through Monday, May 23. The local celebrity chefs will cook in hopes of raising money for their favorite local charities. Melissa Snively, of State Farm, appeared first in early April to begin this year’s event. She cooked for the Brandon Outreach Clinic. Other celebrity chefs appearing at the Copper Bell Café will include Dr. Earl Lennard, supervisor of elections on Monday, April 18. He will be cooking for the Boys & Girls Club. On Monday, May 2, Tony Del Castillo, general manager of the Brandon Times will cook for LifeCare of Brandon. Rich Strehl, financial advisor and executive director of the Brandon Foundation will cook for his own charity on Monday, May 9. Tom Lee, vice president of Sabal Homes and former State Senator will cook for A Kid’s Place on Monday, May 16, and rounding out the local celebrities on Monday, May 23, will be Tammy Bracewell, president of the Brandon Chamber, who will cook for The Y. When you visit Copper Bell Café on these upcoming Mondays, you will be supporting community leaders and their charities. The proceeds from the entire day will be donated. The celebrity chefs will be at the café from 11 a.m.-2 p.m. on their specific day. When not hosting special events, Denington says his café, which seats 40, can create party platters and boxed lunches. The café, which is located at 401 S. Parsons Ave. in Brandon, serves breakfast and lunch seven days a week from 8 a.m.-2:30 p.m.
For more information, please call 681-3354 or visit www.CopperBellCafe.com.